It is up to you to decide which aspects of Farm to School could work well for your farm. For example, you may want to sell products directly to schools, host farm field trips and/or participate in special events or celebrations. These possibilities are described in more detail in Focus sections. By linking local farms with school cafeterias and classrooms, Farm to School can enhance your direct marketing opportunities. And, you can help strengthen school educational programs by offering farm field trips and participating in Farm to School events and celebrations. The following resources describe how school meal programs operate, and ways that you might work with schools. Healthy Hunger Free Kids Act: What Farmers Should Know by University of Michigan Extension specifies how the 2012 nutrition standards can boost opportunities for direct sales of produce to schools. School Lunch 101, by National Farm to School Network and School Food FOCUS, provides bottom-line information about the operation of school meal programs. It is important for you to know that most school meals programs are expected to be self-supporting, without additional funding from school budgets. 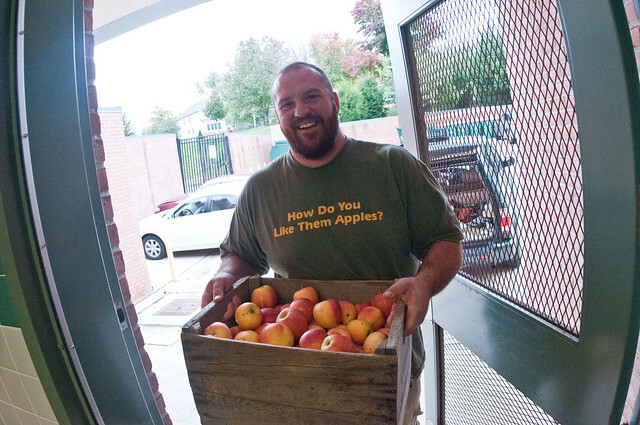 Bigg Riggs Farm owner Calvin Riggleman brought three varieties of apples to Nottingham Elementary School in Arlington, VA, for a National School Lunch Week event. Planting a Farm to School Program, Tips for Farmers by the Community Alliance with Family Farmers (CAFF) can help you explore your interest in and capacity for direct sales to schools. Schools need assurance that locally grown food is safe. Using resources available from Cornell University’s National Good Agricultural Practices Program to assess your food safety risks and implement best practices. A brief Checklist for Purchasing Local Produce by Iowa State University can help prepare you to answer customer’s questions about food safety. Making the Farm Connection: A Guide to Field Trips for Farmers by CAFF can guide you in developing successful farm field trips for schools. Each fall, NYS Department of Agriculture and Markets Farm to School Program and Education Department Child Nutrition Program and partners, support Farm to You Fest! to celebrate local food and agriculture. New York Agriculture in the Classroom sponsors Agriculture Literacy Week and an I Love NY Agricultural Contest that encourage students to learn about New York agriculture. October is National Farm to School Month, a time of many farm-school celebrations.